Ron W. Shaw's most recent book, published by Global Heritage Press, builds on his long time interest in the Lanark Settlers. Quoting widely from personal journals and reminiscences he tells the story of the well over 100 people whose family journey started in Scotland in a period of economic depression and follows them across the Atlantic to settlement in Upper Canada in an area largely unsuited to farming. 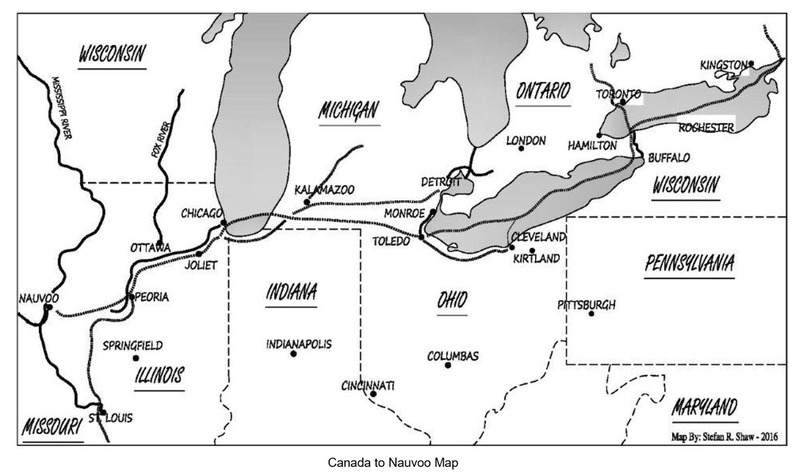 Not long after the revelations to Joseph Smith in nearby Palmyra, New York in 1827 the first Mormon missionaries arrived in Upper Canada. The book focuses of the Lanark families Borrowman, Brooks, Bryce, Bulloch, Caldwell, Climie, Donald, Duncan, Findley, Forsythe, Gardner, Hamilton, Hill, Hood, Leckie, McIntosh, Park, and Swapp who heard the word and later followed the "call to gather in Zion." The book recounts the long multi-year tortuous journeys, through places like Nauvoo and, for some with the Morman Battalion through California, which ended in the years after Brigham Young recognized Utah as that promised land in 1847. Their subsequent life trials, natural disaster and conflict with US authority in the new homeland is the final chapter, all presented as manifest in the individuals experiences — some stories are quite extraordinary. Was a pile driver used to crush rock used for a Morman temple really made from a cannon slung on a pulley system forged for Napoleon’s armies and abandoned following the siege of Moscow? For the genealogist there are nearly 50 pages of family charts and a 32 page name index, compiled by Mike More to aid those with links to the main families but who are not the focus. In addition to the personal collections of those with a family link, A Swarm of Bees: Lanark Society Settlers 1800-1900, A Journey from Scotland to Upper Canada and Utah should be in every library with a historical collection along the route travelled, from the Ottawa Valley to Utah, and in the Morman diaspora to places like southern Alberta. This review is based on a pdf copy supplied by the publisher. This is interesting to me John. First, my family traveled with, but were not part of the group of starving weavers who emigrated to the Perth Military Settlement. They paid their own way. But I am sure they knew almost all the others mentioned in your review.